Workers at the Chemilines pharmaceuticals firm in Wembley, north west London, are stepping up their campaign for decent pay and dignity at work. They walked out on their second one-day strike last week and have now voted unanimously for a three-day strike at the end of this month. The Chemilines workers, who are mostly Asian women, are hoping to hold a public meeting this Saturday to build support for their cause, followed by a march the Saturday after that. The one-day strike on Wednesday of last week had a similarly militant mood to the previous strike on 16 December. It involved mass picketing, with groups of workers stopping several delivery vans from entering the factory and at times confronting management. 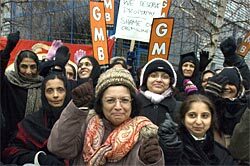 The 120 Chemilines workers are members of the GMB union. They are demanding a 4.6% pay rise this year without strings, as well as an end to the indefinite laying off of around 20 of their colleagues. Brothers Ravi and Jagdish Karia own Chemilines. They tried to head off the strike by claiming the company is a “family”. But they are millionaires while their workforce earns less than £6 an hour. The workers repackage medicines and cosmetics sourced from abroad for sale on the domestic market. The brothers claim that they cannot afford to meet the GMB pay demand because of the economic situation. At the meeting, workers discussed how to step up their campaign. They voted to back plans for a public meeting and protest march, and for a three-day strike on Thursday 28 January, Friday 29 January and Monday 2 February. The workers are waiting for the GMB’s go-ahead to proceed with their plans. Many workers complained about management intimidation since the strike had started. Some workers have received letters demanding that they come to a disciplinary hearing because their performance has dropped below 80 packages an hour. The mood of the workers has hardened since last month, when they called off a planned day of strike action for negotiations with management. They are angry that the Karia brothers then declined to meet GMB officials and the talks came to nothing. Underlying and fuelling the Chemilines dispute is a deep sense of anger among workers at the treatment they endure from management and the conditions they are forced to work in. For example, they are only issued with one set of overalls – which they have to take home and wash themselves at their own expense. Workers who package goods are often told to work in the warehouse during periods when they are not busy. But unlike the full time warehouse workers they are not issued with protective shoes and jackets. The drinking water on site comes out of a single tap that workers say is “dirty and smelly”. They have to pay 5p per cup to get drinking water out of a vending machine. Workers also complained about the state of the toilet facilities in the factory. They are sent warning letters if managers think they have been spending too much time on toilet breaks. There has been no heating on the shopfloor or warehouse for several weeks now.